The lights: Fluorescent. The carpet: Padded. The lanes: Routed. Where in the world could Fish Fry be? DesignCon 2014, of course. 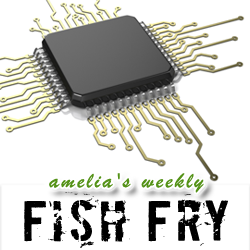 In this special DesignCon episode of Fish Fry, we launch ourselves into the multi-faceted world of electronic design with a couple of interesting interviews. My first guest is none other than Kilopass CEO Charlie Cheng. Charlie and I get down to the nuts and bolts of non-volatile memory, and Charlie gives me his take on where he thinks the technology is headed over the next few years. Next, I chat with Mark Toth (CadSoft) about CadSoft’s ubiquitous EAGLE PCB Design Software, and I get the inside scoop on the results of their recent PCB design survey. And, we’re giving away a GertBoard (courtesy of Newark element14) to one lucky listener this week! Head on over to element14.com/fishfry to enter to win.